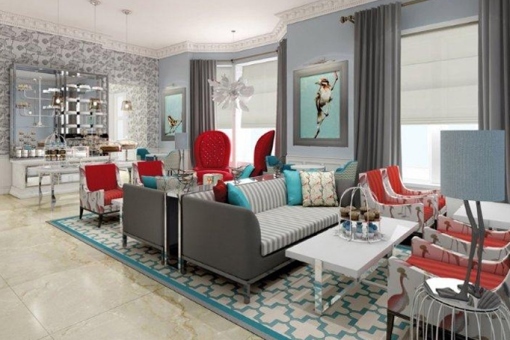 The Ampersand Hotel won its first awards within weeks of its 2012 opening, in South Kensington, with BAL tiling products playing a significant part. 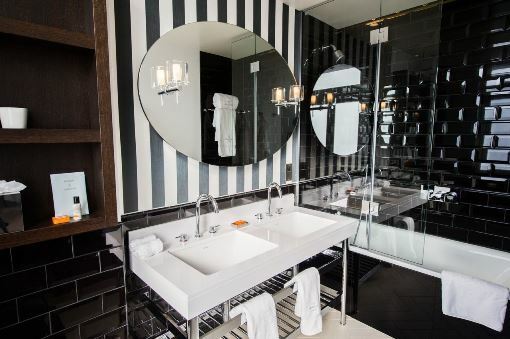 In a London district renowned worldwide for culture and arts, The Ampersand Hotel blends luxury, decadence and quirkiness, alongside the latest in gymnasium facilities and state-of-the-art technology. 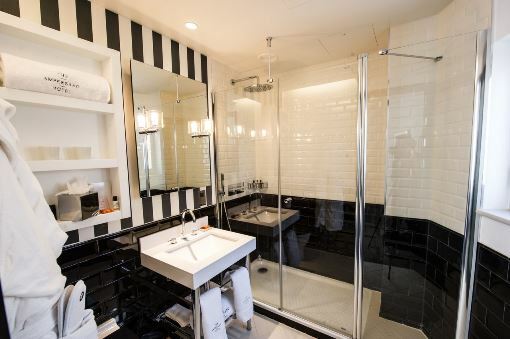 In every area of the hotel, guests can see stunningly tiled walls and floors. BAL was involved from the outset, working with architects Dexter Moren Associates to create the initial M40 specification. It then provided consultancy to both the main contractor, John Sisk & Son, and the tiling contractor, Dyson-Briggs & Sons, during the course of the project. 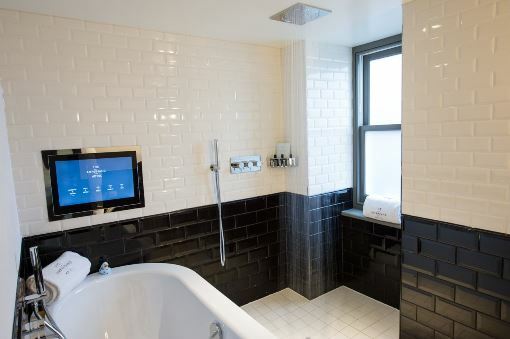 The Ampersand Hotel has approximately 1,485 m2 of tiling, fixed with extensive use of BAL primers, adhesives, grouts, admixtures and allied products. These included: BAL Prime APD, BAL CTF4, BAL Supercover Rapid Flex, BAL Rapidset, BAL Single Part Fast Flex, BAL Stone & Tile PTB, BAL PTB Flexible, BAL WP1, BAL Micromax, BAL Floor Epoxy, BAL Admix AD1 and BAL Admix GT1. A wide range of products was necessary because of the importance of having exactly the right product for any given situation. Tiling was onto a variety of backgrounds and substrates, including plasterboard, plaster, timber (with overlay), concrete, marine ply and steel. High-quality tiling is fundamental to The Ampersand Hotel, from the main entrance to the balconied suites, from the Apero restaurant to the flooring in the lifts. A dozen tile types, in many more sizes, include polished marble, polished silestone quartz and basalt in various colours. Natural stone is used for counter tops and bathroom vanities, in guest rooms and suites, and counter tops in public areas. Floors tiled with natural stone include the reception area, coffee lounge, breakout space, wine room, corridors and lifts. Porcelain is used extensively for guest bathroom walls and public area floors, in black, off-white and matt cream. Floors in guest bathrooms, public washrooms and the restaurant entrance are laid with various shapes and sizes of ceramic tiles in white and cream. Glazed ceramic tiles, in crackled ivory, was specified for the restaurant, bathroom and public washroom walls. For the architects and designers, Dexter Moren Associates, global recognition for The Ampersand arrived within weeks of the hotel’s opening. 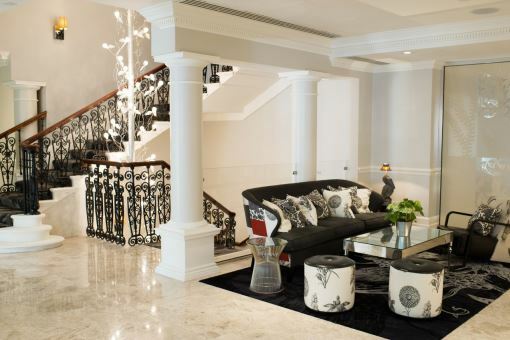 It received the International Design & Architecture Award 2012, in the 50-200 bed category, ahead of The Sanctuary Hotel in New York, Syon Park Waldorf Astoria and the London’s ME Hotel by Foster + Partners. These renowned awards celebrate the best in hospitality design, attracting entries from around the world.